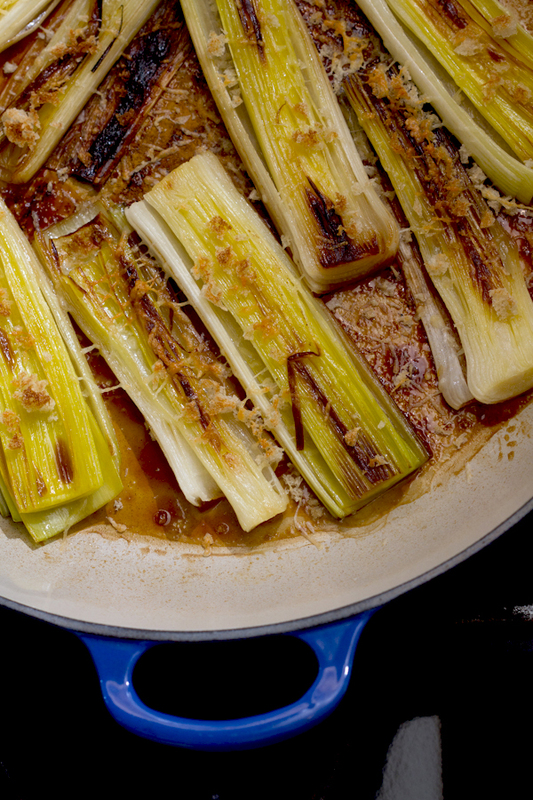 root-end and then cut the leek in half lengthwise. 2. Place the leeks in a bowl of cold water cut side down for 10 minutes. 3. Run water over each leek individually to remove any grit, place on paper towel to dry. 4. Melt the butter in a heavy ovenproof sauté pan over medium heat on the stovetop. the cut side is up and cook until golden, approx 4 minutes per side. 6. Add the stock and reduce heat to low, cover pan and simmer until tender, approx. 15 minutes. 7. Turn oven on to broil. top with bread crumbs, cheese and pepper. 10. Place in oven and broil until breadcrumbs are crunchy and cheese is melted. crispy pancetta or bacon for an appetizer.